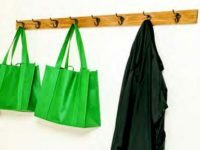 Reusable Shopping Bags: clean and handy! Reusable shopping bags are handy and durable, but they aren’t self-cleaning. Here are some tips to keep your reusable shopping bags clean and your family healthy this fall and winter. • Wash your hands after you get home from the store and before unloading grocery bags. • Launder reusable cotton and synthetic fabric grocery bags frequently. If the bag has cleaning instructions, follow them. If not, turn the bags inside out before tossing them into the washing machine. Detergent and a cold water wash will do the trick. You can dry fabric bags on low heat or line dry them. • Wipe out the inside of plastic reusable or insulated with a damp, soapy cloth and then wipe away any residue with a clean, damp cloth. Turn the bags inside out and allow them to air dry. • Label bags for meat, produce, dairy, packaged food, and cleaning supplies. And, place raw meat into a disposable plastic bag before putting it into a reusable bag. • Never use bags that you use at the grocery store as gym bags, diaper bags, or laundry bags. • Put clean bags near the door so you’ll remember to grab them on your next trip to the store.